Looking back over the past 82 years, our country has changed dramatically. In 1937, there were no home computers, no cell phones and no 24 hour news networks, FDR was starting his second term as president, Amelia Earhart attempted to become the first woman to fly around the world and our country was in the midst of the Great Depression. It was during this late-depression backdrop that a new business was started in Kansas City which would influence the snacking habits of people across the country for generations to come. 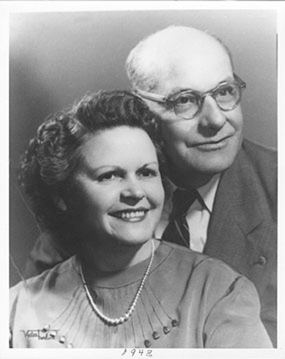 Grandparents, Howard “Pop” White and Dona “Grammie” White started our family business out of the need to support themselves and their 3 children. Grandfather was laid off from his job and with his last paycheck set off to find a way to make a living. After purchasing popcorn, oil, salt and syrup and designing a popcorn popper, he created a business. Friends would come to their home based business to purchase popcorn, fudge and popcorn balls. Grandpa popped the corn and Grammie sealed the products in wax bags with a hot iron to keep it fresh for the customers. Eventually Grandpa was called back to work, but because the business was doing so well, he decided to rent a location on Broadway in downtown Kansas City. Soon, most of the downtown hotels and theaters requested a weekly delivery of popcorn, so Pop quit his job and came back to the business for good. Son, Kenneth also joined the family business and was with the company for over 50 years. In 1954, Velvet Creme Popcorn was the first company to offer gourmet popcorn in a decorated can. These early tins were hand painted with original designs by Ken’s wife Patricia, pioneering what we know today as “Decorated Can Designs”. Velvet Creme Popcorn, the original popcorn in a can is now enjoyed by people all over the world. Our grandparents Howard and Dona and parents Ken and Patricia are no longer with us, but the memories and legacy live on with the 3rd and 4th generation of our family owned and operated business. 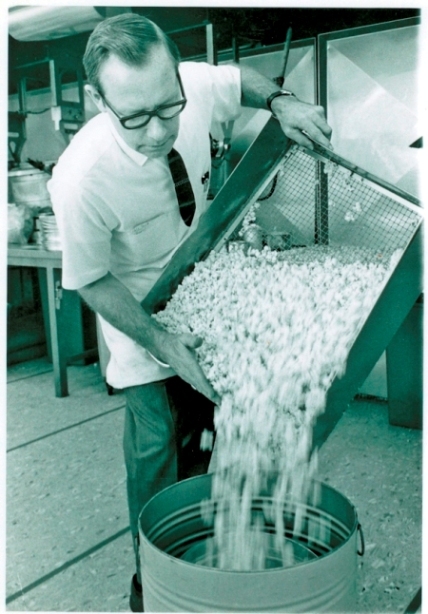 Yes, times have changed since the business started in 1937, yet we continue to use the same quality ingredients and family recipes to produce the finest popcorn products, gifts, candies and snacks for our loyal customers. We are committed to providing quality products and out standing customer service for many years to come.